Traditional braces, lingual braces, Invisalign and more. These are some of the services we offer our patients at Belmar Orthodontics. But, have you ever heard of surgical orthodontics? This is a practice that not only deals with the straightening of the teeth, but deals with correcting jaw abnormalities and problems with bite. Surgical orthodontics is most often used to correct these problems and for cosmetic/aesthetic reasons in older adolescents and adults. Dr. Hardy is highly skilled to prep you for corrective jaw surgery and help you recover. Learn more about surgical orthodontic care and our other straightening options today! Did you know that the American Association of Orthodontics recommends that children have their first orthodontic visit between 7 and 8 years old? Many people may think that’s a young age, but it’s for a very important reason. Giving your child an early oral examination can help detect orthodontic issues that are present and prevent their progression. A child’s jaw is continually forming all the way until they are about 18 (for boys) and 16 (for girls). During this time, if a bite problem manifests itself, it can easily be corrected with early orthodontic care. What bite problems might we be talking about? Underbite – The lower jaw juts out more than the upper, which prevents proper function of the mouth and can lead to TMJ. Crossbite – Teeth overlap unevenly over one another (some in front of and some behind the lower teeth). This can cause bite problems, wear and tear, tooth breakage and more. Openbite – There is an inadequate overlap of the front teeth. The front teeth may not touch the lower ones at all. This is caused by tongue thrust, thumb-sucking, or from the jaw not growing evenly. It can cause major dysfunctional chewing patterns and wear to the back teeth of the mouth. Overbite – The upper jaw extends out over the lower one instead of lining up straight. This can cause your teeth to bite into your gum tissue and will cause wear to the lower front teeth. Impacted Teeth – A tooth that has not erupted correctly in the mouth. Wisdom teeth are the most common form of impaction. Canines and premolars can also become impacted though. 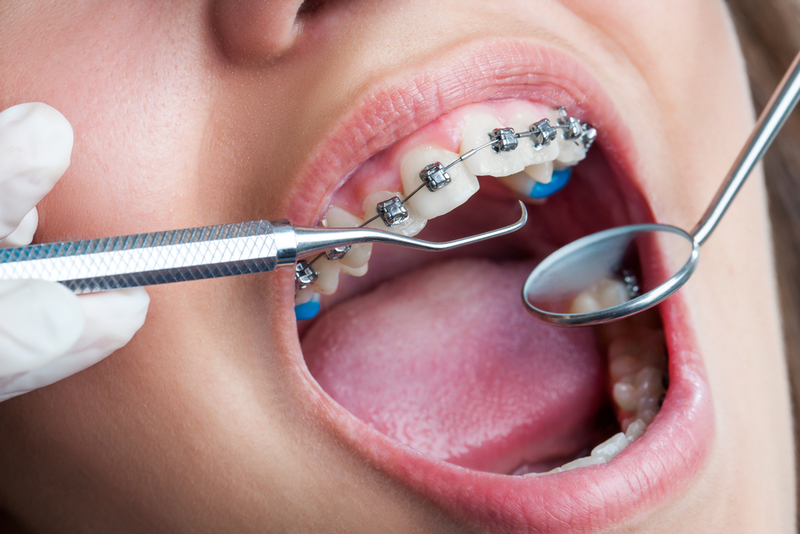 If you are like many others, you may not know too much about surgical orthodontics (a.k.a. corrective jaw surgery) and just how life-changing it can be for many patients. If you have a bite problem present (such as the examples we mentioned above), you may experience trouble chewing, biting, breathing, speaking and performing basic functions with your mouth. Corrective surgery can fix your bite problem and restore correct function to your mouth if bite-correction orthodontic care was not utilized as a child. This surgery can only be done on older patients after the jaw has finished forming in later adolescence (16-18 years old). Traditional Metal Braces – The metal brackets we know and love. This is your cheapest option for straightening and one of the most effective. Ceramic Braces – Want the structure of traditional braces without them being so noticeable? Our ceramic braces are naturally white already, which blend in with the teeth. We can make the wire white as well. Lingual Braces – These are metal braces custom-made and attached to the back of your teeth instead of the front. These can achieve the same effect as metal braces without being detectable. Invisalign – A system of transparent, removable aligners custom-made to fit your mouth. You will receive new aligners every few weeks that will gently mold your teeth into proper alignment. The aligners are clear and straightening can be done discreetly. We then work closely with an oral surgeon who will perform your actual corrective jaw surgery. For the upper jaw, the surgery generally involves shifting the jaw backward, forward, upward or downward for proper alignment. For the lower jaw, the oral surgeon can move your jaw forward or backward. We are with you for the months of the pre-surgical phase and stay with you for the rest of the post-surgical phase as you heal. Surgical orthodontics is a complicated process. You will need some pre-surgery orthodontic straightening as well as post-surgical straightening as well that lasts between 6-12 months. With how fast time passes though, it’s worth the time it takes to be able to breathe, chew, bite and speak properly again. At Belmar Orthodontics, we take special care to provide you effective treatments for you that will change your life forever. Surgical orthodontics can literally change your life if you have any bite or aesthetic problem that ails you. For more about orthodontic surgery, call our Belmar Orthodontics office today at (303) 225-9016 for your free consultation!